ExhibitDEAL recently had the pleasure of collaborating the celebration of the 75th anniversary of Miami Country Day School, with the installation of a whimsical Wizard of Oz themed 240ft printed yellow brick road that lead to the celebratory event venue. The success of the project lead to its feature in the September issue of notable printing publication, Digital Output. Designing and printing the yellow brick road brought together the creative minds of exhibitDEAL’s team and our vendor partners to result in a unique winding yellow brick road, that helped bring the classic story into life. Below we feature the article by Cassandra Balentine, detailing how the project came to life. Click here to view the September issue of Digital Output, article begins on page 28. The most creative graphic displays are often the result of many talents collaborating for a common goal. Such is the case for a unique project pulled together last Spring for Miami Country Day School. The Miami, FL-based educator looked to recreate the infamous yellow brick road from the film, The Wizard of Oz, for an event at the school marking its 75th anniversary. Coincidently, both the film and the school celebrated 75 years in 2014. “It also played in well with the overall objective of the celebrations to bring the alumni home and work together to make sure the school continues to pave the way for future generations,” says Maria Daza, VP of Marketing, ExhibitDEAL and a parent of a Miami Country Day student. 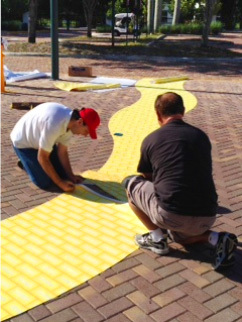 Over the course of a few weeks, a yellow brick road was printed, shipped, and installed. The graphic became a core part of a magical Oz-themed celebration. 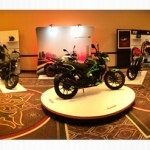 Miami Country Day administrators knew Daza’s company created trade s how displays and wanted its help to create graphics for the anniversary event. In addition to common backdrops and signage, a winding yellow brick road was suggested to help tie the theme together. At first thought, a yellow road may seem like a simplistic design. However, when you think about the dimensions and considerations for a successful layout, it requires careful planning. While Daza had experience with floor graphics, she realized the complexity of the project and looked to additional resources. She put the word out to Dale Smith, VP, D&P Media for Print, Inc.–a distributor for wide format media–about the project and from t here, Smith pulled in two Boston, MA-based connections, Century Type, Inc., a print service provider; and Tom Berrigan, a graphic designer. Daza explains that the school wanted a playful look for the brick road. The design wasn’t meant to simulate real bricks, but instead something from a child’s imagination. It was important that it was a winding road, as the school wanted to emphasize the campus’ newly constructed Franco Center, which houses the library, broadcast center, and computer labs, and where the event was held. Tom Berrigan, a graphic designer of 13 years, worked out a creative concept for the road with Daza. “We had back and forth email conversations for a couple of weeks until the panels were just right,” he recalls. Adobe Systems Incorporated Illustrator Creative Cloud (CC) and FreeHand MX were used for the design and Adobe Photoshop CC for file proofing. Berrigan admits that it was a challenge to design a single panel that could be used repeatedly to make a seamless, curved walkway. He explains that he did not have the exact dimensions of the presumed pathway. Despite a physical walk through with measurements, it was not possible to exactly define, as stairways, landscaping, and other variables had to be considered. He used satellite images to get an idea of the total length of the road. But, without exact dimensions, it seemed that creating a seamless, curvy brick pattern would be a challenge. In this scenario, the bricks would need to line up end to end to allow the installers to repeatedly use the same design. Berrigan created a panel that installers could slice and use to create any kind of curvy path. There were straight, curved, and corner pieces to be installed in Lego-like fashion, with extra pieces calculated to cover any last-minute changes. Once the panel design was finalized, it was sent over to Century Type to produce. The family-owned print provider celebrates over 15 years creating wide format graphics. Dennis Shea, VP, Century Type, learned of the yellow brick road project from Smith, and agreed to produce at cost for the school. The two decided that panoRama Walk & Wall media by Continental Grafix USA, Inc. would be ideal for Miami Country Day. The media is designed for short- to medium-term indoor applications. “One thing about this material is that it lies down beautifully,” says Shea. “If you have a clean surface–even a road–you can sweep it and put it down,” he adds. The files prepared by Berrigan were print ready, so setup was minimal. In regards to the color palette, Shea admits yellow can sometimes be a bit tricky, but in this case he ran the job without incident. The graphics were run a little slower than typical production, and took about six hours. Close to two and a half rolls of the media were printed on Century Type’s Hewlette-Packard latex-based printer. Once the printing was complete, Century Type rewound the rolls and mailed them to the school for cutting and installation. Shea adds that media’s ease of use was ideal for this situation, as his team did not handle the actual installation. “panoRama Walk & Wall is so easy to use; anyone can put it up and take it down, which is key. Once the school received the panels and were ready to cut and install, it enlisted the help of exhibitDEAL. Although the media was user friendly, there were some challenges that resulted in the install team relying on all of the spare panels. Daza also recalls it being a 90°F day, which affected the media’s adhesive, making it stickier than usual. Removal was handled by the school staff and completed with no incident. Miami Country Day was lucky to enlist the help of vendors to create inspiration–and a magical night– for education. “The school communications team was so delighted that their vision was brought to reality in such a visually attractive fashion,” recalls Daza. “Just by the entrance to the building, they were greeted by teachers dressed up as the main characters of the film, who graciously posed with them for pictures in front of a specially designed backdrop that combined both the school logo and the Wizard of Oz theme,” recalls Daza. Wide format graphics are only limited by imagination and the yellow brick road project for this FL-based school is an ideal example.